I was fortunate to have grown up in the art colony of Rockport, Massachusetts and to have been exposed to plein air painting by my father and his associates at a very early age. My attraction to the French and American Impressionists and my choice of art as a career grew from and was nurtured by this environment. I get my inspiration from nature. I love to paint on location, a plein air painter, a true student of nature. There is no substitute for feeling the quality of the light – I enjoy capturing that moment in time. I strive to find exciting, original ideas and to paint each subject truthfully and honestly. Yet I try to combine this honesty with careful editing and wise decision-making and a strong idea behind the scene. Caleb Stone was born in the artist’s colony of Rockport, Massachusetts where he began drawing at age four, painting at seven, and attending professional artists’ workshops by the time he was twelve. 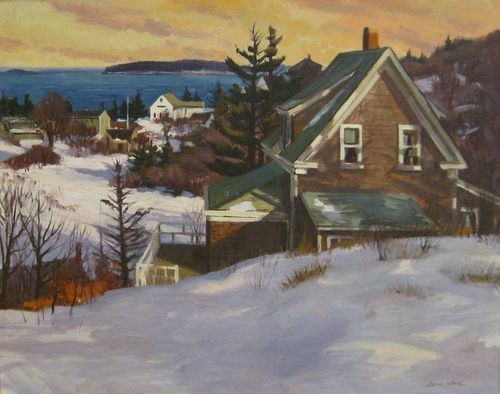 After graduating from Kennebunk High School in 1985, he enrolled in the Lyme Academy of Fine Arts in Connecticut which he attended through the spring of 1990. In the autumn of 1989, he was the Artist in Residence at the Juniper Hill Inn in Windsor, Vermont. Caleb is a representational-impressionist painter focusing on landscapes and marine scenes. He works primarily in oil, but also in watercolor and pastel. He focuses on painting scenes throughout the New England area. He offers tutoring classes weekly and holds up to four week-long workshops annually. Additionally he performs frequent demonstrations for art associations throughout eastern Massachusetts. For more information about the artist go to: www.calebstoneart.com.